1 tube of choice – I used the amazing artwork of Amberly Berendson which can be purchased from DigitalArt Heaven. 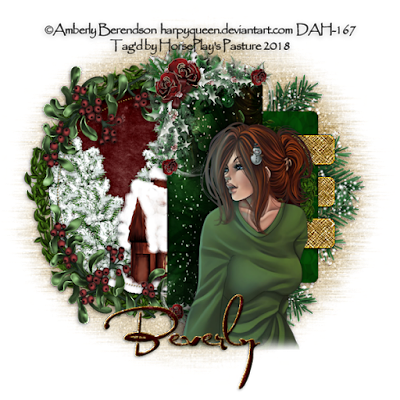 “Winter Green Collab” is a collaboration of 6 designers and can be purchased from Digital Art Heaven here. 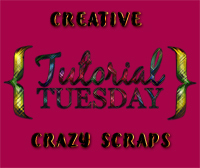 For this tutorial I used Moonshine Dezinez beautiful portion. You can check her site here. Highlight each element and tap the delete key. Close out the original paper layer (don’t delete this paper layer). Template layers 5 and 6 should now be on the same layer. Move the original Paper layer (that you closed out) so that it’s just above the merged template layer in your layers pallet. Highlight the merged template layer. Click on both shapes with your Magic Wand. Right click on it and choose “Promote Section to Layer”. 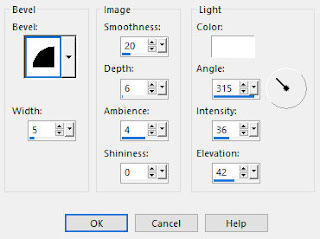 You can now delete the original paper layer. Move into a position you like over the paper layer. Change the Properties of the tube to Overlay. Use the Pick Tool to push the top and bottom in just a bit and pull the left side out just a bit.